HACKENSACK, NJ, February 12, 2013�-�Vidyo,�Inc., today announced that Frost & Sullivan has named Vidyo the winner of its 2013�Video Conferencing Technology Leadership Award�after a thorough review and evaluation of the top three vendors in the global video conferencing market. To achieve this award, Vidyo's performance against key video conferencing competitors was benchmarked using the following criteria: Development of New Technologies, Leverage of New Technologies, Brand Perception, and Customer Value. 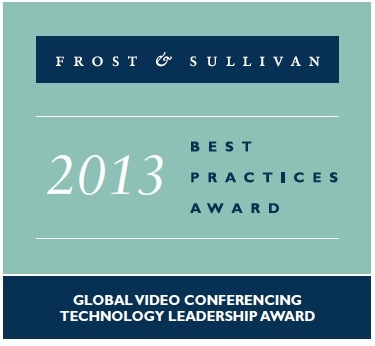 Frost & Sullivan's�"Best Practices Research Report" details the evaluation process and analysis that determined the winning recipient and states that "Vidyo's market leading innovations continue to demonstrate its technology lead and commitment to make video conferencing a ubiquitous technology." To read the full Frost & Sullivan report,�click here. "Vidyo is at the forefront of innovation, launching products that demonstrate the power of its ground breaking architecture and position the company for growth," said Roopam Jain, Principal Analyst, Frost & Sullivan North America, Information and Communication Technologies Practice. "Vidyo's solutions offer customers a new and more scalable approach to video conferencing, eliminating the traditional hurdles to adoption including high fixed costs for multipoint infrastructure, QoS-enhanced networks and IT personnel." Frost & Sullivan cites that Vidyo is ahead of the market, shipping third generation SVC-based products that incorporate field experience, customer feedback and intellectual property that creates sustainable differentiation. In addition, they believe that recent Vidyo technology and product announcements like�VidyoWay�and�the first $750 Executive Desktop System, continue to demonstrate Vidyo's commitment to make video conferencing a universal technology for visual communications. According to the F & S report: "The ability for customers to embed Vidyo into their own web portals and service environments via Vidyo's APIs has enabled innovative new solutions and service offerings from a variety of OEM partners including Google+ Hangouts, Ricoh, Nintendo and Philips." "We are honored to have received this recognition of our continued efforts to provide exceptional, affordable video conferencing that has created new markets not previously addressable by traditional technologies," said Ashish Gupta, Vidyo's CMO and SVP Corporate Development.� "Since Vidyo launched in 2008, we have been committed to changing the face of video conferencing; raising the bar set by incumbent providers by delivering superior value, accessibility, and scalability that is only available via Vidyo's unique software platform. We are extremely proud to have been deemed a market leader by Frost & Sullivan, especially after such a rigorous evaluation." The Vidyo communication and collaboration platform is software-based, highly flexible and can be easily customized for individual enterprise and vertical market video conferencing needs. The�VidyoRouter� is based on the company's patented Adaptive Video Layering architecture and leverages the standard based Scalable Video Coding (SVC) technology. It eliminates the MCU and offers unprecedented error resiliency, low latency and rate matching enabling natural, affordable, high quality video to work over the Internet, LTE, 3G and 4G networks. The Vidyo platform allows users to quickly leverage the latest hardware innovations and new consumer devices, making it uniquely attractive to partners. Vidyo has been active driving H.264 SVC, HEVC and SIP videoconferencing interoperability in various standards bodies since 2005. 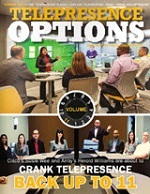 Vidyo, Inc. pioneered Personal Telepresence enabling natural, HD multi-point videoconferences on tablets and smart phones, PCs and Macs, room systems, gateways that interoperate with H.323 and SIP endpoints, telepresence solutions and affordable cloud-based visual communications solutions. 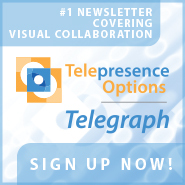 Learn more at�www.vidyo.com, on the�Blog�or follow�@vidyo�on Twitter. HACKENSACK, NJ, February 12, 2013�-�Vidyo,�Inc., today announced that Frost & Sullivan has named Vidyo the winner of its 2013�Video Conferencing Technology Leadership Award�after a thorough review and evaluation of the top three vendors in the global video conferencing market. To achieve this award, Vidyo's performance against key video conferencing competitors was benchmarked using the following criteria: Development of New Technologies, Leverage of New Technologies, Brand Perception, and Customer Value. Frost & Sullivan's�\"Best Practices Research Report\" details the evaluation process and analysis that determined the winning recipient and states that \"Vidyo's market leading innovations continue to demonstrate its technology lead and commitment to make video conferencing a ubiquitous technology.\" To read the full Frost & Sullivan report,�click here. \"Vidyo is at the forefront of innovation, launching products that demonstrate the power of its ground breaking architecture and position the company for growth,\" said Roopam Jain, Principal Analyst, Frost & Sullivan North America, Information and Communication Technologies Practice. \"Vidyo's solutions offer customers a new and more scalable approach to video conferencing, eliminating the traditional hurdles to adoption including high fixed costs for multipoint infrastructure, QoS-enhanced networks and IT personnel.\"
Frost & Sullivan cites that Vidyo is ahead of the market, shipping third generation SVC-based products that incorporate field experience, customer feedback and intellectual property that creates sustainable differentiation. In addition, they believe that recent Vidyo technology and product announcements like�VidyoWay�and�the first \$750 Executive Desktop System, continue to demonstrate Vidyo's commitment to make video conferencing a universal technology for visual communications. According to the F & S report: \"The ability for customers to embed Vidyo into their own web portals and service environments via Vidyo's APIs has enabled innovative new solutions and service offerings from a variety of OEM partners including Google+ Hangouts, Ricoh, Nintendo and Philips.\"
\"We are honored to have received this recognition of our continued efforts to provide exceptional, affordable video conferencing that has created new markets not previously addressable by traditional technologies,\" said Ashish Gupta, Vidyo's CMO and SVP Corporate Development.� \"Since Vidyo launched in 2008, we have been committed to changing the face of video conferencing; raising the bar set by incumbent providers by delivering superior value, accessibility, and scalability that is only available via Vidyo's unique software platform. We are extremely proud to have been deemed a market leader by Frost & Sullivan, especially after such a rigorous evaluation.\"